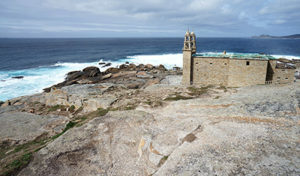 The Costa da Morte, on Galicia’s Atlantic coast, stretches from Fisterra to Malpica. English seamen in the XIV century frequently referred to this land as the Coast of Death, as it was known to be a black spot for shipwrecks, due to its difficult and dangerous geography. But even before English seamen encountered trouble along this coast, Fisterra was considered to be the end of the world and a very special place by the Romans and pagans and pre-Christian cultures. It was here where the sun disappeared under the sea, connecting the world of the living and the land of the dead and their spirits. Along the Finisterre Way, you will also find many oscillating stones (pedras de abalar), said to predict tragedies. 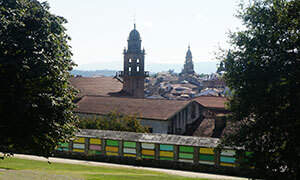 In Santiago de Compostela, you will find the imposing Quintana square at the back of Santiago’s cathedral, which is said to have ‘invisible’ residents. The square is divided in two by a set of stairs: the upper part of the square is called Quintana dos Vivos (Quintana of the Living), while the lower part of the square is the Quintana dos Mortos (Quintana of the Dead), as it was used as a burial ground until 1780. The shadow of a pilgrim is said to appear in a corner of the square every night. After 1780, the burial ground for the city got moved to San Domingos de Bonaval. Many head to Bonaval Park, next to the convent, to find a peaceful reading or relaxing green space with lovely views of the city. Opened in 1994, the park sits on the old cemetery grounds. While in Galicia, you must also be careful not to bump into the Santa Compaña, a procession of dead souls feared by many. This very unique procession of restless souls wanders about after midnight, particularly favouring crossroads in country lanes (corredoiras in Galician) and being particularly active on special nights such as Halloween but also Mid-Summer. If you meet them at a crossroads you should draw a circle on the ground and step inside it to avoid being taken by the group. And never ever accept their candle, if they offer it to you. Or you will be forever wandering Galicia’s country lanes. 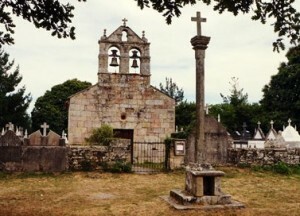 Due to this fear of the Santa Compaña, many ‘cruceiros’ (stone crosses) are very strategically placed in crossroads all over Galicia’s countryside. Now you know their real purpose: they will help you escape the recruitment efforts of the Santa Compaña, particularly this time of the year! 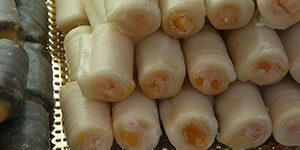 Also frequently found on country crossroads, ‘petos de ánimas’ (soul pockets) are designed to gather little token offerings for ‘the souls’, so they can leave the purgatory and reach heaven. Once in heaven, they will intervene for those who have left a little gift or token of their respect. If anything else fails to keep you safe from scary spirits along the Camino de Santiago, we recommend you have a sip of Queimada (literally meaning ‘burnt’), a punch drink made of Galician spirited ‘augardente’ (fire water) mixed with lemon peel, coffee beans, cinnamon and sugar. A special spell is read out while setting alight the concoction so the Queimada will keep the bad spirits and bad witches away. 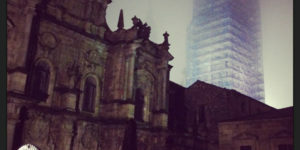 *A spooky Camino de Santiago adventure in Galicia, from Sarria to Santiago de Compostela, starts from €560 per person sharing. For more information or to book your Camino trip contact our travel specialists.